Wed, 24-Apr-2019 - 18:58:49 ---- The fact: 42.844.000 visitors done. As if the recent rise in steel prices weren’t enough, now automotive stamping suppliers are faced with the difficult task of getting high-strength steel (HSS) to form parts with tooling designed for mild steel. 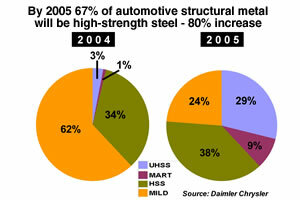 In an effort to reduce vehicle weight and improve gas mileage, automotive manufacturers will increase their use of HSS, also called advanced or ultrahigh-strength steel, in structural parts by 80 percent in 20051 models, when 67 percent of all structural parts will be made of HSS. Some are predicting that soon 90 percent of a car’s body could be made of HSS,2(see Figure 1) despite the fact that the average cost of this steel is twice that of automotive-grade cold-rolled sheet. That’s about 17.5 million tons per year, as compared to 3.5 million tons in 2001 (see Figure 2 ). The same attributes that give HSS its strength also can cause part reject rates to rise because of splits and poor uniformity if changes to improve metal flow and reduce friction aren’t implemented. The material’s high kilopounds per square inch (KSI) (a measure of yield strength), increased springback, and tendency to work-harden and run at elevated forming temperature create a host of tooling challenges. 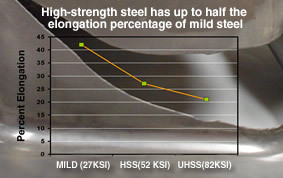 According to an American Iron and Steel Institute/Department of Energy study,3 HSS has up to half the elongation percentage as mild steel (see Figure 3), in addition to reduced n value, making HSS significantly more difficult to draw than conventional cold-rolled grades. The reports also states that the forming lubricant quality influences drawability. During a recent production test at a Tier 1 automotive supplier, high solids polymer (HSP) (see Stretching metal’s forming limits with HSP) lubricants proved to provide consistent tool protection and friction control on a suspension part made from 82-KSI ultra high-strength steel (UHSS). During the evaluation, temperature, strokes per minute, and part quality were measured. The temperature averaged 240 degrees F. The same part made from 50-KSI material averaged 150 degrees F. Part uniformity and material thinning were measured with circle grid analysis. The test resulted in consistent tool protection and acceptable part uniformity. The lubricant was able to provide the necessary tool protection even at very high temperatures. Historically, extreme-pressure (EP) lubricants have been considered the best approach to achieving high-performance tool protection on the most demanding deep-drawn or heavy-gauge formed parts. Sulfur and chlorinated EP additives blended with straight oil have a long history of improving tool life success. With the introduction of new-generation metals such as HSS, and stringent environmental and disposal requirements, EP oil’s value has diminished. 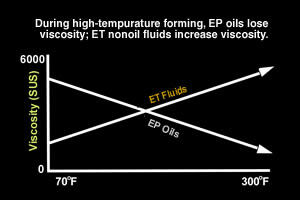 Under the high heat required to form HSS, EP oils lose their performance. They can’t provide the physical tool-protecting barrier required for extreme-temperature (ET) applications. ET versions of HSP lubricants do provide the necessary protection. As metal deformation in the stamping press raises tool and metal temperature, EP oils become thinner, and in some cases flash or burn (see Figure 4). The average HSP lubricant has a thin viscosity when applied; however, as the temperature rises, the viscosity becomes thicker and more tenacious. In fact, ET fluids are heat-seeking and will attach to hot metal, creating a friction-reducing film barrier. This protective barrier allows the tool to stretch and form metal without splitting or metal pickup during the most demanding operations, thus controlling friction and metal flow. As HSS becomes the new standard for automotive stamping suppliers, understanding how well your lubricant choice works with your steel and tooling design should be a business priority. The optimal combination can contribute significantly to the bottom line. Tom Stundza, Reed Business Information, Feb. 7, 2002. American Iron and Steel Institute (AISI), Automotive Applications Committee (AAC) and Department of Energy (DOE), March 2003.